We got the boys a Chemistry set for Christmas. The instructions said to put heated test tubes in a glass as they could melt the plastic rack supplied, so we decided a better option would be to make a test tube rack out of wood. Scientists of old would make all their own equipment apparently, especially items such as glassware, although I think that's beyond my skills to help with. Ollie designed the rack based on looking at the shape of the plastic rack and measuring the test tubes he was going to be storing in his rack. Once the diagram was complete with measurements, the boys headed out to the shed with Matt to construct the rack using wood I had picked up from a discount items bin (I wasn't sure what we'd use it for when I bought it, but it's good to have a small supply ready for projects). 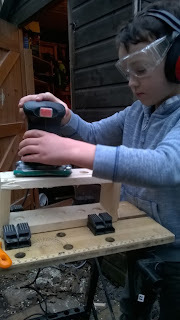 Ollie did all of the measuring, marking, cutting, drilling, sanding and waxing himself with a little help. He also wrote his and Toby's names and the date on the base of the rack which Matt then carved in using a Dremmel-type tool. Later on we got to try out the new rack for the first two sets of experiments in the chemistry set. The first was a series of dissolving experiments to find out if certain chemicals were soluble or insoluble (new vocab for the boys). The second experiments were to find out if substances dissolved faster in cold or hot water, which were a good chance to try out the spirit lamp supplied. The boys were really excited to use the 'lab' set up they had asked for a couple of months ago to do 'proper' science since we mainly used the kitchen table up until now. They both got a notebook to use to record their findings, and Toby especially liked ticking off the correct predictions he made on the results table I drew for him. 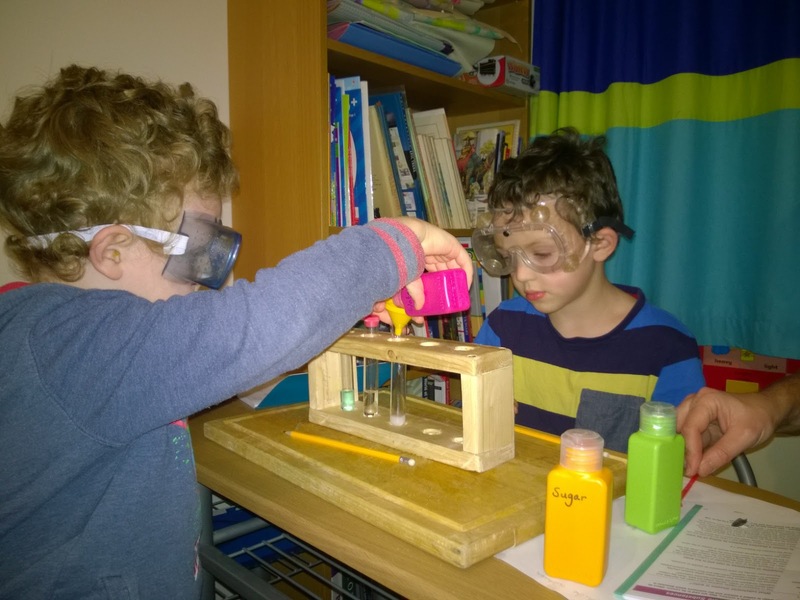 We try to provide a really wide range of opportunities from different subject areas for the kids, but I have to admit I'm enjoying their interest in Science. 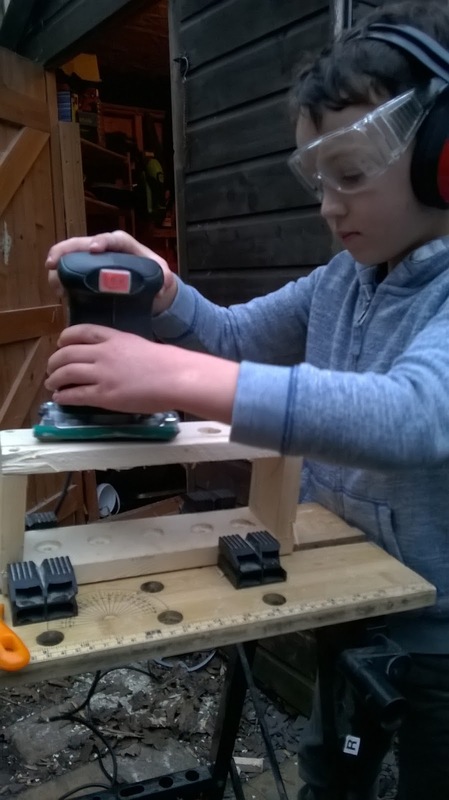 Safety bit: As usual, use common sense when doing potentially hazardous activities with kids - proper safety equipment and supervision is required whether wood working or dissolving salt in test (personally, we do the hot bits e.g. heating the test tube for the kids, they do measuring and pouring). Read and follow all the safety notes that come with activities and keep activities within your own comfortable knowledge and experience levels. 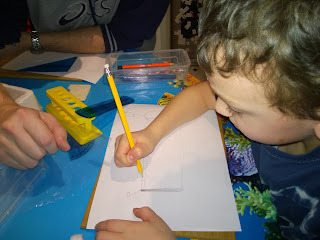 It's often helpful to try new things out on your own without the kids 'helping' if you haven't done something before, so you can work out your own risk assessment of the activity ahead of time. Not mentioned on the safety leaflet for our kit, but I think really important to think about is that a spirit lamp is obviously a naked flame, so kids should be in cotton or real wool clothing/ cotton lab coat, not synthetic fibers or a plastic painting overall as these can melt onto skin if they catch fire. Tools, chemicals etc are stored out of reach when not in use, and never used unsupervised.